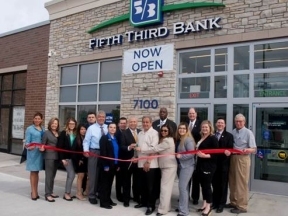 Fifth Third Bank (5/3 Bank), a diversified financial services company, is the second opening in Berwyn Gateway Plaza Phase II. In partnership with the City of Berwyn and Berwyn Development Corporation (BDC), Fifth Third Bank, located at 7100 W. Cermak Road, held a grand opening celebration on May 26th. Fifth Third Bank now joins Starbucks in the second phase of redevelopment at Berwyn Gateway Plaza. Fifth Third Bank relocated from its previous location next door at 7112 W. Cermak Road into this new space. They were able to remain open throughout the duration of the construction project. The completion of the Fifth Third Bank development project will help to accelerate the remaining construction of the second phase of redevelopment at Berwyn Gateway Plaza. The full development is anticipated to be completed by the beginning of 2017. “Fifth Third Bank has always been an anchor in the Berwyn community and in the Cermak corridor. We are glad they chose to stay in Berwyn and welcome them to their new home. We wish them all the best.” 7th Ward Alderman Rafael Avila continued, “It’s always great to open new businesses, but it’s also nice to open an existing business because it shows a history of success and a commitment to the community. The City of Berwyn welcomes you again,” said Mayor Robert J. Lovero. Business hours are Monday-Thursday from 9:00 a.m. to 5:30 p.m., Friday from 9:00 a.m. to 6:00 p.m. and Saturday from 9:00 a.m. to 2:00 p.m.